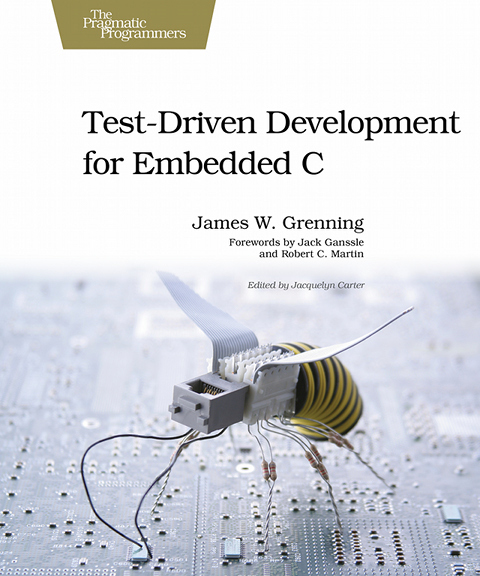 Why Test-Driven Development for Embedded C? Another day without Test-Driven Development means more time wasted chasing bugs and watching your code deteriorate. You thought TDD was for someone else, but it's not! It's for you, the embedded C programmer. TDD helps you prevent defects and build software with a long useful life. This is the first book to teach the hows and whys of TDD for C programmers. TDD is a modern programming practice C developers need to know. It's a different way to program---unit tests are written in a tight feedback loop with the production code, assuring your code does what you think. You get valuable feedback every few minutes. You find mistakes before they become bugs. You get early warning of design problems. You get immediate notification of side effect defects. You get to spend more time adding valuable features to your product. James is one of the few experts in applying TDD to embedded C. With his 1.5 decades of training, coaching, and practicing TDD in C, C++, Java, and C# he will lead you from being a novice in TDD to using the techniques that few have mastered. This book is full of code written for embedded C programmers. You don't just see the end product, you see code and tests evolve. James leads you through the thought process and decisions made each step of the way. You'll learn techniques for test-driving code right nextto the hardware, and you'll learn design principles and how to apply them to C to keep your code clean and flexible. To run the examples in this book, you will need a C/C++ development environment on your machine, and the GNU GCC tool chain or Microsoft Visual Studio for C++ (some project conversion may be needed).